All over the world. Discover a wide range of genres, styles and sounds from all cultures and continents, with the Lee Oskar Harmonica. Tuned in Minor F#. Most commonly used to play Blues, Country, Folk, and Jazz. The legendary mouth harp designed by the late 1970s Lee has maintained a reputation of outstanding quality. Designed with air-tight precision. The Harmonic Minot is made to produce the most robust sounds. Taking the stage with the distinctive harp riffs that featured in top of the charts, classic hits. From 'Cisco Kid' and 'Low Rider', with the pioneer funk/jazz group WAR. To view notation layout information, please see the PDF. In pursuit of excellence, Lee Oskar has created a distinction between industry standard and outstanding manufacturing quality. Teaming up with Tombo, a musical instrument manufacturer and industry leaders in the field. The Japanese-based musical instrument company have dominated the industry for over 80 years. Producing the harmonicas of the highest quality. Impressed by the quality of their production, Lee collaborated with Tombo, to create a mouth organ that would revolutionise the harmonic playing experience. And in a bid to eliminate the most of the mechanical issues that musicians faced as they played. Lee and Tombo gave due diligence to researching and developing a new mechanical structure to the harmonica. The result? Lee Oskar and Tombo changed the game. Whereas standard harmonicas were made with wooden combs, Lee replaced these with plastic combs. This was to eliminate the chance of swelling while making it easier to clean the instrument. This allowed for much more performance precision. While the recessed bed held the reed plates securely, and as a result, preventing unwanted air leakage. This airtight engineering design coupled with Tombo’s outstanding production process makes Lee Oskar’s harmonicas incredible to play. Carefully designed with interchangeable reed plates, you never have to buy another harmonica again. Simply replace your old reed plates and keep your incredible harmonica for years. Made to serve you a lifetime. All harmonica’s are stamped with Lee Oskar's label to mark the authenticity and professional status of each harmonica. Delivered in a durable plastic box that can be attached to each other with smart wear solution. 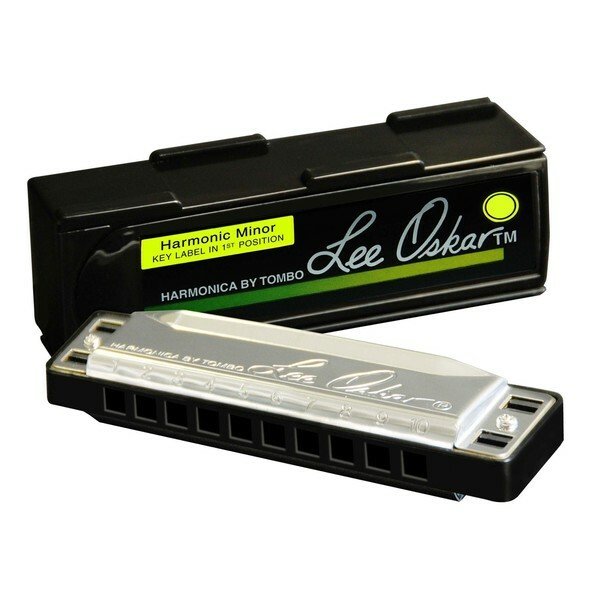 Each Lee Oskar harmonica comes in a convenient interlocking box which is colour-coded for each tuning. Colour coding and model designation at both ends of the game facilitate on stage use. Finished with stainless steel cover plates, the Lee Oskar Harmonica’s are specially designed to lie comfortably against the lips and while producing a stronger and softer tone.